Image: Amazon. Design: Kinrick Fleuradin/SheKnows. When you become a parent, a lot of joy is brought into your life, but your schedule is bound to get tighter, too. Suddenly, there’s so much to keep track of: keeping up with homework assignments and staying on schedule at work, juggling dinner and reading bedtime stories. It’s a lot, but it doesn’t have to be so difficult. Amazon Echo helps you save time by streamlining your day. It provides hands-free access to information like traffic updates and dinner recipes. These are just a few of the ways that Echo and Alexa can save you time in your busy day. Echo Dot Kids Edition allows you and your kids to ask simple homework questions, like spelling a word, researching a science topic or double-checking math. You can also use Echo Dot Kids Edition to set a homework or silent reading timer, so your kids know when time is up. If you’re in a hurry to make dinner, ask Alexa to find a recipe on Allrecipes to make life easier. You can either ask Alexa to look up something on Allrecipes (for instance, “fettuccini alfredo recipe”) or ask for recipes that include ingredients you have on hand (“I need a recipe with beef and tomatoes”). You can even specify how long you want the recipe to take to cook, so if you’re really pressed, you don’t end up making something more involved than you really have time for. Picking out your kids’ outfits the night before school will make mornings easier, but what if you choose shorts and a T-shirt only to wake up to rain? With an Echo, you can ask Alexa about the weather forecast while choosing clothes, saving you the hassle of last-minute outfit changes in the morning. We don’t know what’s harder, remembering to write things down or not losing the list once it’s written. With Echo and Alexa, you don’t have to worry about keeping track of your shopping list anymore. When you want to access the list, you can either have your Echo read it out loud to you, see it on the Amazon Shopping app or view it on the Alexa app that lives on your phone or tablet. No more wasting time writing, rewriting and searching for those lists! Schedules are important when you’re a parent, but sticking to them can be hard. It’s easy to get caught up with work only to realize your kids have been indulging in hours of screen time or that nap time was supposed to end an hour ago and now you’ll be up all night with your child. 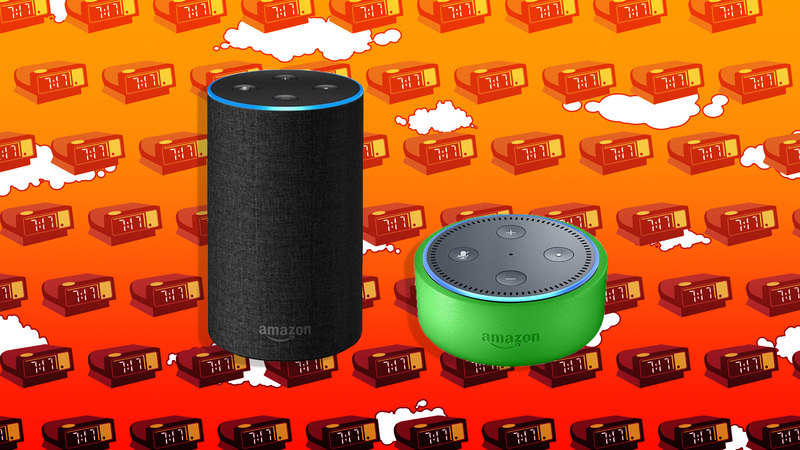 Luckily, you can easily use Alexa to help stay on track. Just say, “Alexa, set timer,” and you can set a timer for however long you need. You can also ask Alexa to set alarms and reminders and keep a calendar, so you never get behind schedule or forget to do important tasks. You want to stay informed, but it’s also hard to find the time to read or watch the news when you’re busy juggling your kids’ schedules. Luckily, you can get the news from Alexa. Listen to your favorite news podcast, or just hear about the day’s biggest headlines while making lunches or washing the kids’ uniforms. Enable your favorite news source’s skill, then ask Alexa for their news summary. You’ll stay informed without having to spend too much time tracking down the info. Between work and dropping kids off at school, practice and social events, most parents are in the car a lot. This means traffic can throw a big wrench into your day. But you can use Alexa to find out about traffic before you leave the house, allowing you to plan ahead and find alternate routes. All it takes is one Echo device to streamline your life as a parent. You’ll have more time to spend quality moments with your family and more time to spend on self-care, too. This post is sponsored by Amazon Echo.